To understand the amazing country of Morocco, I think you have to begin with the sun above, the sand beneath, and water that flows both above and below. Travelers tend to ascribe a certain mystique to Morocco. Often it focuses on notions of the exotic such as the aromatics of its flavorful cuisine, belly dancers who move in amazing ways, colorful souks with their myriad products, and always Islam’s veiled women and ubiquitous mosques. But I think the mystique of Morocco runs even deeper to an almost primordial vein. My first intuition of the dynamic use of solar power in Morocco came with sightings of solar panels in places I didn’t expect to see them. I was definitely surprised to see this solar panel at the bottom of Erg Chebbi where we had a picnic lunch before riding camels into the dunes of the Sahara. The panel seems likely responsible for the hot meal served us in the middle of an active day following 4×4 dune-riding. 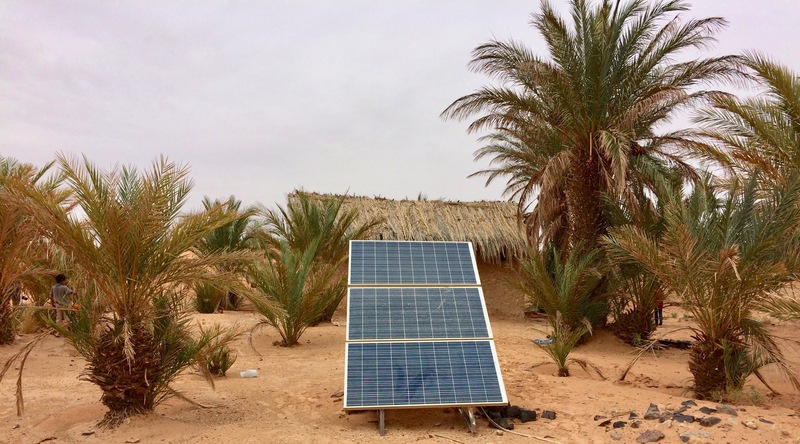 On the other side of the oasis, we had just visited a Bedouin woman in her hand-made woolen tent, making this solar panel seem like a huge anachronism. 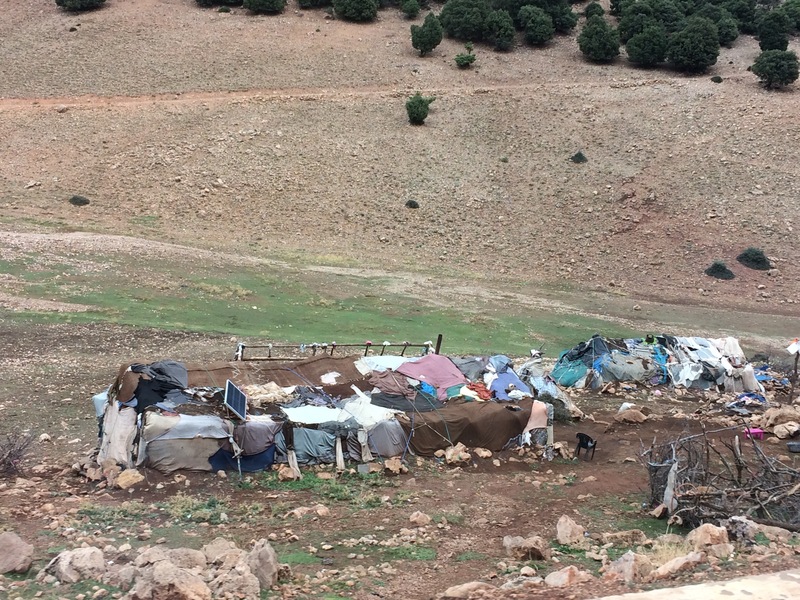 But after I learned about Morocco’s Noor project, maybe the Bedouin woman’s lifestyle has become the anachronism. On the road into the High Atlas mountain range in the area of Meknes-Tafilalet I began photographing what I saw out the window as we were driving along. I hoped to capture images of the shepherds and their flocks like the one below that I’d photographed near Meknes. Shepherding seems like such a mind-numbing occupation that I had a sincere interest in how they managed it. When they gazed out into the distance, what were they thinking about? Would I see anybody reading a book or playing an instrument? Would they ever be training their dogs or whittling a stick? Can you spot the solar panel? I’ve learned since returning home that Morocco’s solar power initiative forms a massive complex in the Sahara near Ouarzazate. Appropriately, the name “noor” comes from the Arabic word for “light.” Each year the government expands the project with new phases and the building of new dams to provide water. The mirrors cover an area of roughly 1.4 million square metres. The first phase of this plant generated enough electricity to supply 650,000 people when it was switched on in 2016. By 2020, or even sooner, the $9 billion solar power plant is expected to generate 580 megawatts (MW), enough electricity to power over a million homes. I can only wish that North America were equally as ambitious in searching out sustainable energy alternatives. Instead, our political leaders encourage us to return to coal. Now that’s an unforgivable anachronism.